Jordan, despite legions of honors, had never graced the cover of a U.S. video game until now. Jordan has never appeared on a video game cover in the U.S.
(CNN) -- Michael Jordan won six NBA championships, five MVP awards and was a 14-time All Star, but there was one honor that had avoided his grasp -- until now. Jordan was named the cover athlete for the upcoming "NBA 2K11" (2K Games) video game. According to his business manager, this is the first time that Jordan will be on the cover of a game in the United States. "Michael was very flattered to be approached by 2K Games and has watched the growth of innovation in video games," Estee Portnoy said. "His fans, mostly in the 18 to 34 year old group, always asked him why he wasn't in a video game." 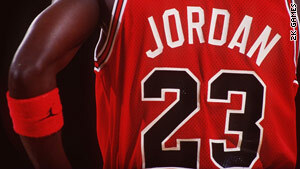 Portnoy said "His Airness" was heavily involved in the creativity of the game. Jason Argent, vice president of marketing at 2K Games, said the company didn't want to just treat Jordan as a cover athlete, but wanted his input as part of a complete "athlete integration" into the game. "We think we are making the best (basketball) video game so we wanted the greatest basketball player ever," Argent said. "Our goal and mandate is to continue to push the look and feel of basketball." While Argent would not confirm that Jordan is available as a player in the game, Jordan may have tipped his hand when asked about the honor. "I have no doubt that 'NBA 2K11' will be a big hit with gamers and basketball fans alike," Jordan said. "I'm looking forward to getting back out onto the court virtually. Let's hope they get my dunk from the foul line right." "NBA 2K11" is scheduled to come out on October 5 for all console platforms and the PC.